With the new Conversion Pro template you will see some of the old template options if you have used any of our other themes. 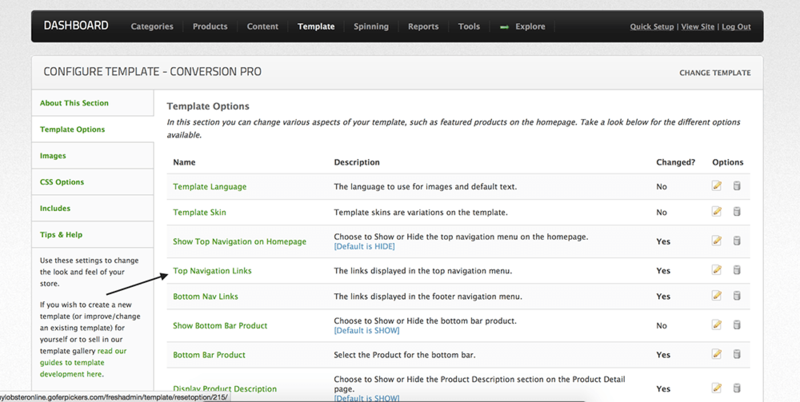 In this guide we will go over some of the new template options for Conversion Pro. The best advice we can give you is to take 15 minutes and click and read each of the template options descriptions that are under each parameter. Its easy to reset a parameter to default if you don’t like the changes you did. Product Detail Page: All the various sections (description, amazon description, features, etc.) can be shown or completely hidden, and you can change the title of each section. Top Navigation Bar Show / Hide on Homepage. (Always shows on all pages except homepage. Can also show on homepage, but must turn on – it is off by default. Options to Show / Hide amazon logo in footer and also options to select the logo color (white or black) for if the footer background is changed. 2. 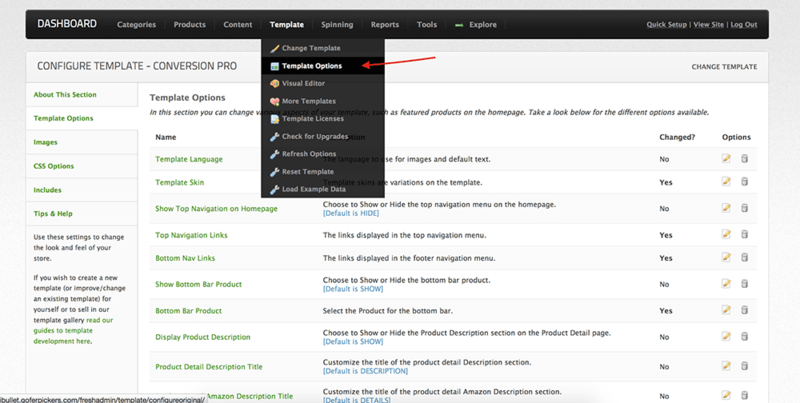 On the Template Options page, you will see multiple tabs for different features. For this guide, please click the Template Options tab on the left. This will bring up all the options you have for the current theme enabled for you store. Please go thru each template option to quickly learn how the theme works and you will be able to setup your theme faster. 3. If you change a parameter and are not happy with the outcome, you can quickly reset it to default by clicking the Garbage Can icon. This theme comes with 14 different color theme skins that you can quickly select to change the color scheme of your website. All the hard work of picking matching colors is done for you. Just click on the Template Skin parameter and select the skin you like. This 14 different color schemes also match the 14 button and background colors that are available in the various homepage widgets. Bottom Bar: Choose to show or hide the bottom bar and pick a product. Adds the fixed bar at the bottom, like Apple, with title, price and Add to Cart button. You have 2 options for this feature. One of them is to Enable/Disable it and the second one is to select the product for the bottom bar. This is how the Bottom Bar product looks on your store. When you click on Bottom Product Bar template option. You will need to do a search for a item you added to your store. When you find the item you want for the bottom bar product, all you need to do is click the green icon. All the various sections (description, amazon description, features, etc.) can be shown or completely hidden, and you can change the title of each section. You can enable/disable any of the tabs shown in the image below. You can also change the text of each tab and I highly recommend doing that. You don’t want to be using the same text as everyone else. These are all the options for the Product Detail tabs. Not all of your products might have the tabs shown under the Template Options tab. But if you compare your product page as shown in the image above and the template options, you will see which apply to the item you have. Each Tab will have 2 parameter options. One is going to be to Enable/Disable the tab and the other one will give you the option to rename the tab. Using the Visual Editor, you can quickly change the color scheme of your store and see the changes live on the right side. All you need to do is login to your Freshadmin control panel and click on Templates – Visual Editor. The images below will show all the options you have for the Conversion Pro Visual Editor theme. You can easily click to edit each option and select your custom color code. If you want to enable/disable the social media sharing bar on the left, you can quickly disable it. 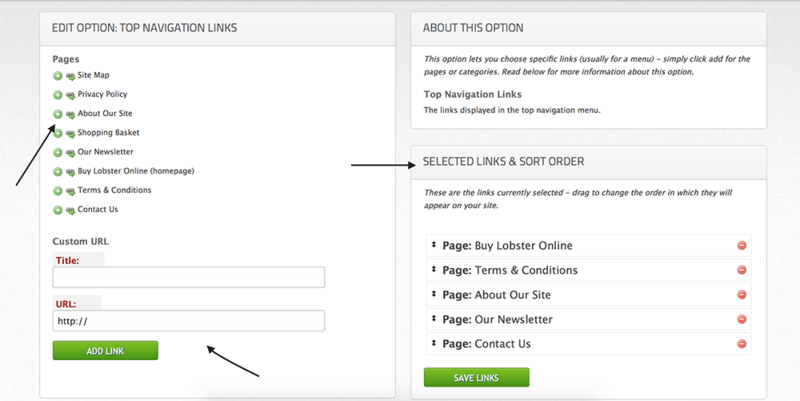 With this template option you can enable/disable the top bar that shows your Top Navigation Links that you have set on the Homepage. This Top Navigation bar will ALWAYS show on the other pages of your site, but you can choose to hide it on the homepage to have more of a traditional landing page look. The arrows on the right show the Top Nav Links and on the left is the Site Title. If you want to set different pages or custom links to be displayed in the bar then you will need to edit the Top Navigation Links template option and there you can quickly add any FSB content pages or custom links. You will have 2 parameters for this feature. One is the enable/disable the logo and another one is to select the color between White or Black. If you have changed your footer color, you may need to select a different color for the Amazon logo.